Introduction: Iron-deficiency anemia (IDA) is quite common in female adolescents and adults worldwide. Despite the higher prevalence of IDA, there is a paucity of research in finding its prevalence and potential causes in young Saudi female population. Thus, the aim of this study was to determine the prevalence and possible causes of IDA in young female medical students and search for risk factors in the studied group. Materials and Methods: One hundred and twenty female students from Imam Abdulrahman Bin Faisal University were selected by randomized sampling whose blood samples were taken to measure their hemoglobin (Hb) and serum ferritin levels. According to the World Health Organization criteria, individuals with Hb <12 g/dL and ferritin <15 ng/mL were considered anemic. The sociodemographic, gynecological, and dietary data were collected from all the respondents with the help of a well-designed 15 items questionnaire. The association between IDA and the potential risk factors was found through Fishers' exact test or Chi-square test. Results: Among the studied group, 38.3% of total population were anemic. Mean Hb ± standard deviation (SD) was found to be 12.6 ± 1.3 and mean ferritin ± SD was 18.9 ± 5.2. No statistically significant correlation (P > 0.05) was found between IDA and the background, gynecological history, and dietary habits of the anemic participants. Conclusions: The higher prevalence rate of anemia among Saudi female medical students (38.3%) was similar to the earlier reports of the Gulf region. Considering the higher ratio of anemic students, iron supplements should be prescribed to the affected youngsters to improve their Hb level. Higher hemoglobin (Hb) levels are associated with improved performance and quality of life (QOL). Its deficiency, known as anemia, causes poor pregnancy outcome, suboptimal learning and cognitive function, disturbed behavior, poor attention, and growth issues in the affected individuals. The definition of anemia as explained by the World Health Organization (WHO) and most frequently used in epidemiologic studies is when Hb concentration is <12 g/dL in women and 13 g/dL in men. Anemia is a common but multifactorial condition which continues to be a problem in the developing world. Approximately one-quarter of the world's total population is suffering from anemia. In teenage and early adulthood only, the WHO estimates the prevalence of anemia to be 22.6%–54.0%. Anemia has many types, and among them, iron-deficiency anemia (IDA) has the highest prevalence., In many developing countries, it has reached to an epidemic level and is recorded as the most prevalent micronutrient deficiency in the world., Its deficiency has remarkable negative effects on the suffering individuals. Among the commonly known negative outcomes, impaired mental and physical growth, poor motor function, diminished work capacity, and an overall poor QOL are the most pronounced ones. Within the affected adults, females suffer from anemia the most. A recent study reported the prevalence rate of anemia to be 58.9% in Saudi Arabian women. This prevalence rate is considerably higher as compared to the findings of Rasheed et al. who reported 41.3% prevalence rate in Saudi females. The greater number of affected females shows increased prevalence rate over this period of time. In young IDA inflicted females, it causes lifelong effects on the affected individuals such as poor maternal and neonatal outcomes and pronounced risk of disability in their lives ahead. Despite its severity and unfortunate after effects, the latest information on the prevalence and the associated risk factors of IDA are scarce in the context of young Saudi females. Few studies have reported the prevalence of IDA in Saudi females; however, the potential risk factors associated with IDA were mostly not the focus of these studies, especially in the eastern region. Due to this gap in the literature, this study aimed to evaluate the causes and risk factors of IDA among female youngsters and also intended to report any significant risk factor associated with this condition. It was a cross-sectional observational study which was done between June and November 2017. Through random sampling, a total of 120 otherwise healthy female students were selected who were studying at Imam Abdulrahman Bin Faisal University. Those female students who had a reported eating disorder, pregnancy, breastfeeding, or a history of medication/nutritional supplements were excluded from the study. After explaining the purpose of investigation, an informed consent was obtained from all the participants. The confidentiality of their personal details and study results was ensured. The ethical approval for this study was obtained from the ethics and research committee of Imam Abdulrahman Bin Faisal University. Before blood sampling, students were also asked to fill a questionnaire of 15 items to obtain their personal and demographic data. The structured questionnaire was based on the prior literature and was recently used and pilot tested by Riyadh and Osama.,,, The three major domains covered in the questionnaire were the information regarding the personal sociodemographic data (marital status, mother's education level, and family history of anemia); gynecological and obstetric history (age of menarche, length of cycle, duration of menstruation, the presence of clot, history of flooding, and chronic bleeding); and dietary habits (intake frequency of breakfast, meat, vegetables, Vitamin C, and drugs). Approximately 15 min were taken by each participant to fill the required information. The blood sample collection was done on campus for the convenience purpose. A sample of venous blood (10 mL) was collected from each student on the same day when the questionnaire was filled by them. The vacutainers, which were used to perform venipunctures, were of two types, one had ethylenediaminetetraacetic acid in it for hematological tests including Hb, mean corpuscular Hb, hematocrit, mean corpuscular Hb concentration, and mean corpuscular volume. Beckman Coulter LH750 machine was used to perform these tests. For biochemical screening, vacutainers were used without the addition of any anticoagulant. The purpose was to allow the blood sample to clot while it was assigned to a serum separator. A modular machine was used to calculate serum iron, ferritin, and total iron capacity. The statistical analysis was performed by Statistical Package for the Social Sciences (SPSS) version 22 (SPSS Inc, Chicago, IL, USA). The results were presented as number and percentage. Fishers' exact test or Chi-square test was used for testing the association between anemia and its potential predictors. During analysis, the participants were gathered into anemic or nonanemic groups according to the WHO criteria. Participants with Hb <12 g/dL and ferritin <15 ng/mL were considered to possess IDA. Value of P < 0.05 was considered to be statistically significant. According to the WHO classification, it was found that 46 female students (38.33%) had anemia and 74 (61.67%) had normal Hb and ferritin levels. Mean ± standard deviation (SD) of Hb was found to be 12.6 ± 1.3 and mean ferritin ± SD was 18.9 ± 5.2. The age range of the participants was from 18 to 24 years with a mean age of 20.2 years. 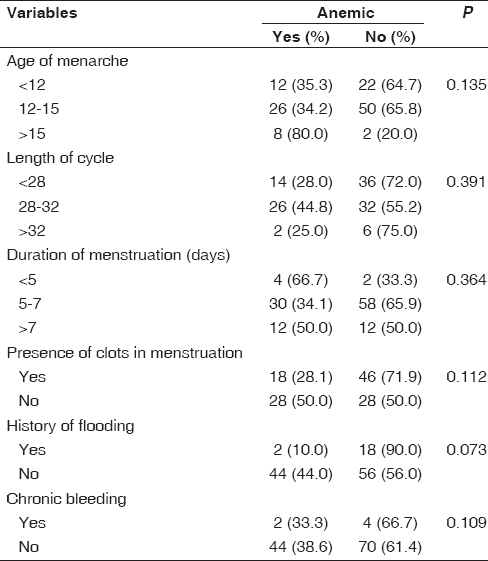 The mean age of menarche was 12.8 years. The mean length of the menstrual cycle was 27 days and mean duration of menstruation was 6.6 days. A proportion of 16.7% of students had a history of flooding and 53.3% of students had a history of clots. Only four students were married. Positive family history of anemia was found in 45% of participants and 5% had a history of chronic bleeding. [Table 1], [Table 2], [Table 3] show the distribution of IDA according to students' background, gynecological history, and dietary habits, respectively. In all the cases, a significant association between anemia and included variables could not be found. Anemia is a commonly known and widespread condition, but its prevalence differs in developing and developed countries. For instance, 43% of total population is suffering from anemia in developing countries whereas its prevalence rate is significantly lower in highly developed countries which is reported at 9%. One such example can be seen in an Indian study which reported 44% prevalence of anemia among female students. Similarly, IDA, which is an anemic condition, has also been detected at higher rate among female students in other developing countries. In a study, Shill et al. found IDA in 63.3% of Bangladeshi female students. On the contrary, in developed countries such as Australia, only 3% female university students were found to be suffering from IDA. In local Saudi context, the prevalence of IDA (38.33%) found in the current study is significantly lower as compared to previous study which reported 64% prevalence of IDA. Interestingly, in a recent study, Alzaheb and Al-Amer have reported the prevalence of anemia to be 12.5% in female students which are significantly lower than the current findings. Current findings showed that female students who were anemic reported lower consumption of meat. The heme form of iron is largely found in meat which has an absorption rate of 50%. The nonheme iron type is typically found in fruits, vegetables, and dairy products. Meat consumption plays a vital role in preventing IDA. Many existing studies strongly suggest a negative correlation between low meat consumption and increased chances of IDA., One contributing factor toward less consumption of meat could be the low socioeconomic background. The meat is relatively costly that can prevent families of humble background to consume it on daily basis. Işık Balcı et al. reported that families with poor background consume red meat and fish which result in less intake of iron. The iron intake is not the only contributing factor in decreasing the chances of IDA. There are other dietary factors which enhance or inhibit the iron absorption, one such factor is Vitamin C intake. Vitamin C (ascorbic acid), found in citrus fruits, has already been reported as an enhancer for iron absorption found in nonheme foods., Previous research has associated low citrus fruit consumption with an elevated risk of anemia. In this study, the effect of Vitamin C intake on the absorption and bioavailability of iron has also been calculated. While doing so, it was found that most reported cases of IDA had inadequate intake of Vitamin C. However, the negative correlation was not statistically significant. In the current findings, IDA showed no statistically significant association with the sociodemographic gynecological variables which are in line with a recent study conducted by Alquaiz et al. However, this finding is in contrast to some prior studies which have been conducted in Saudi context and have reported that IDA has a significant relationship with past personal, medical, and/or gynecological history of the participants. In the present study, there are some limitations to report. First, this study was quantitative in nature and is unable to report the rationale of its findings. In the future, a longitudinal observatory study will be more helpful in evaluating the actual affiliation between the variables and IDA. The second limitation is related to the context specificity and its findings, therefore, may lack generalizability for other ethnic groups. The present study concluded the overall prevalence of IDA among the apparently healthy young Saudi female students. In this study, 38.33% of females were found anemic. The study also tried to find the association of anemia with personal, gynecological, and socioeconomic risk factors. The high rate of anemic prevalence can be encountered by awareness campaigns, improved nutritional habits, and regular iron intake through diet or supplementation. Lozoff B, Smith JB, Kaciroti N, Clark KM, Guevara S, Jimenez E, et al. Functional significance of early-life iron deficiency: Outcomes at 25 years. J Pediatr 2013;163:1260-6. World Health Organization. Worldwide Prevalence of Anemia 1993 to 2005. Geneva, Switzerland: World Health Organization; 2008. Shander A, Goodnough LT, Javidroozi M, Auerbach M, Carson J, Ershler WB, et al. Iron deficiency anemia – Bridging the knowledge and practice gap. Transfus Med Rev 2014;28:156-66. Sirdah MM, Yaghi A, Yaghi AR. Iron deficiency anemia among kindergarten children living in the marginalized areas of Gaza Strip, Palestine. Rev Bras Hematol Hemoter 2014;36:132-8. Abu-Ouf NM, Jan MM. The impact of maternal iron deficiency and iron deficiency anemia on child's health. Saudi Med J 2015;36:146-9. Chandyo RK, Henjum S, Ulak M, Thorne-Lyman AL, Ulvik RJ, Shrestha PS, et al. The prevalence of anemia and iron deficiency is more common in breastfed infants than their mothers in Bhaktapur, Nepal. Eur J Clin Nutr 2016;70:456-62. Abbaspour N, Hurrell R, Kelishadi R. Review on iron and its importance for human health. J Res Med Sci 2014;19:164-74. Hurrell R, Egli I. Iron bioavailability and dietary reference values. Am J Clin Nutr 2010;91:1461S-1467S. Alquaiz AM, Gad Mohamed A, Khoja TA, Alsharif A, Shaikh SA, Al Mane H, et al. Prevalence of anemia and associated factors in child bearing age women in Riyadh, Saudi Arabia. J Nutr Metab 2013;2013:636585. Alquaiz AJ, Khoja TA, Alsharif A, Kazi A, Mohamed AG, Al Mane H, et al. Prevalence and correlates of anaemia in adolescents in Riyadh city, Kingdom of Saudi Arabia. Public Health Nutr 2015;18:3192-200. Pasricha SR, Drakesmith H. Iron deficiency anemia: Problems in diagnosis and prevention at the population level. Hematol Oncol Clin North Am 2016;30:309-25. Salih S, Alqahtani H, Almalki A, Alfaifi F, Gazwani M, Faqehi H, et al. Anemia and dietary habits among pregnant women in Jazan, Saudi Arabia. Br J Med Med Res 2015;10:1-8. Rasheed P, Koura MR, Al-Dabal BK, Makki SM. Anemia in pregnancy: A study among attendees of primary health care centers. Ann Saudi Med 2008;28:449-52. Cao C, O'Brien KO. Pregnancy and iron homeostasis: An update. Nutr Rev 2013;71:35-51. Al Hassan NN. 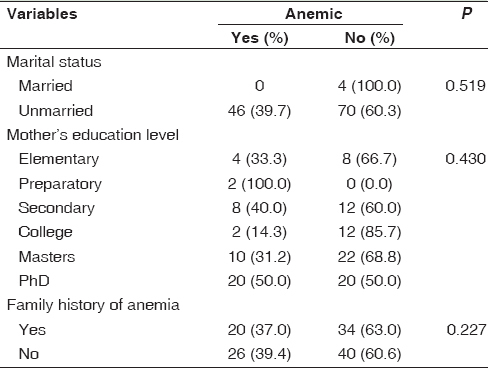 The prevalence of iron deficiency anemia in a Saudi University female students. J Microsc Ultrastruct 2015;3:25-8. Mekuria A, Bekele A, Tilahun M, Bekele A. Prevalence of anemia and its associated factors among pregnant women attending antenatal care in health institutions of Arbaminch town, Gamo Gofa Zone, Ethiopia: A cross-sectional study. Hindawi Public Corpor 2016;10:1-9. Al-Sayes F, Gari M, Qusti S, Bagatian N, Abuzenadah A. Prevalence of iron deficiency and iron deficiency anemia among females at university stage. J Med Lab Diagn 2011;2:5-11. World Health Organization. Global database on Body Mass Index. World Health Organization. Available from: http://www.assessmentpsychology.com/icbmi.htm. [Last accessed on 2018 Jun 18]. World Health Organization. Iron Deficiency Anemia Assessment, Prevention and Control. A Guide for Programme Managers. Geneva, Switzerland: World Health Organization; 2001. Fayet-Moore F, Petocz P, Samman S. Micronutrient status in female university students: Iron, zinc, copper, selenium, Vitamin B12 and folate. Nutrients 2014;6:5103-16. Shams S, Asheri H, Kianmehr A, Ziaee V, Koochakzadeh L, Monajemzadeh M, et al. The prevalence of iron deficiency anaemia in female medical students in Tehran. Singapore Med J 2010;51:116-9. McLean E, Cogswell M, Egli I, Wojdyla D, de Benoist B. Worldwide prevalence of anaemia, WHO vitamin and mineral nutrition information system, 1993-2005. Public Health Nutr 2009;12:444-54. Bano R. Nutritional anemia in the medical students. Indian Med Gaz 2012:16-8. Shill KB, Karmakar P, Kibria MG, Das A, Rahman MA, Hossain MS, et al. Prevalence of iron-deficiency anaemia among university students in Noakhali region, Bangladesh. J Health Popul Nutr 2014;32:103-10. Alzaheb RA, Al-Amer O. The prevalence of iron deficiency anemia and its associated risk factors among a sample of female university students in Tabuk, Saudi Arabia. Clin Med Insights Womens Health 2017;10:1179562X17745088. Hooda J, Shah A, Zhang L. Heme, an essential nutrient from dietary proteins, critically impacts diverse physiological and pathological processes. Nutrients 2014;6:1080-102. McDermid J, Lonnerdal B. Nutrient information: Iron. Adv Nutr 2012;3:532-3. Bhargava A, Bouis HE, Scrimshaw NS. Dietary intakes and socioeconomic factors are associated with the hemoglobin concentration of Bangladeshi women. J Nutr 2001;131:758-64. Işık Balcı Y, Karabulut A, Gürses D, Ethem Çövüt I. Prevalence and risk factors of anemia among adolescents in Denizli, Turkey. Iran J Pediatr 2012;22:77-81. Keskin Y, Moschonis G, Dimitriou M, Sur H, Kocaoglu B, Hayran O, et al. Prevalence of iron deficiency among schoolchildren of different socio-economic status in urban Turkey. Eur J Clin Nutr 2005;59:64-71. Chiplonkar SA, Agte VV, Mengale SS, Tarwadi KV. Are lifestyle factors good predictors of retinol and Vitamin C deficiency in apparently healthy adults? Eur J Clin Nutr 2002;56:96-104. Cook JD, Reddy MB. 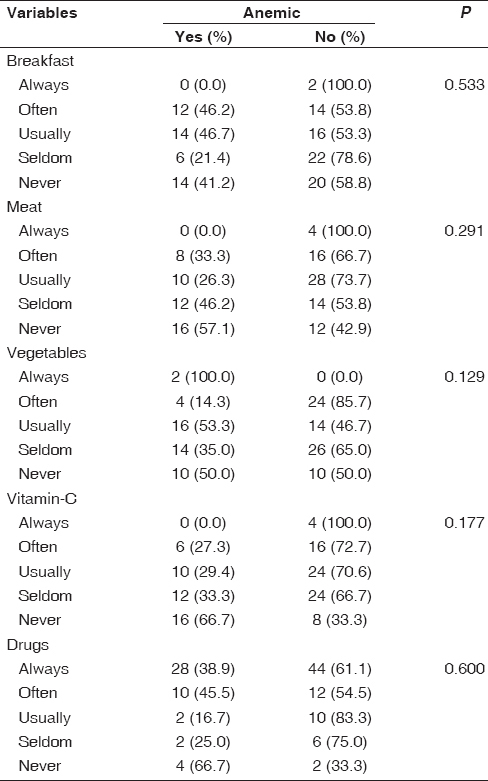 Effect of ascorbic acid intake on nonheme-iron absorption from a complete diet. Am J Clin Nutr 2001;73:93-8.